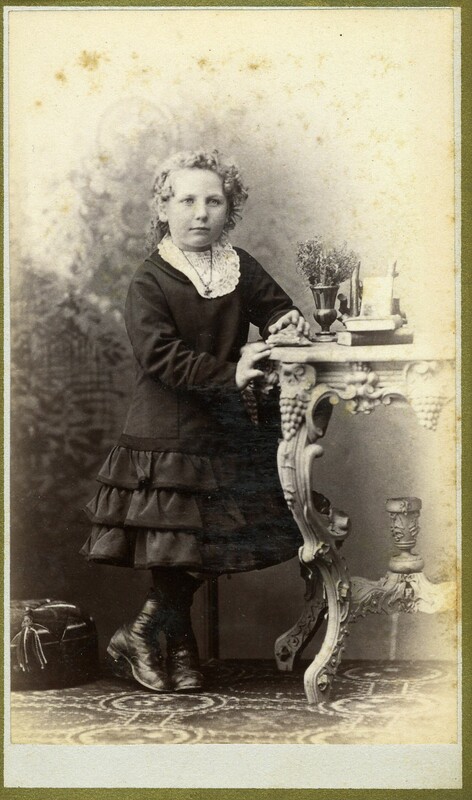 This photograph is an example of the use of elaborate furniture in early portrait photography. The style of the table with its carved fruit appears to be done in the Naturalistic style of the mid 19th century, which often mergerd with the Rococo Revival style of the same period. Since this was taken by a Grand Rapids photographer, we might assume the table was made by a local manufacturer. The young girl, probably a member or friend of the Bremer or Landauer family, is dressed in a mid-calf length dress with three tiers of ruffles on the bottom, and a white lace bib collar. She stands next to the ornate table that holds books and a vase of flowers. Printed on the back of the card: M. W. Owens, Photographer, 31 Monroe St., Grand Rapids, Mich. Some foxing on upper background.